The four-party meeting in Geneva ended in an agreement on a phased de-escalation of the conflict in Ukraine. For the first time since the start of the “Ukrainian revolt”, all the parties, involved in one way or another, seem to have outlines of a common platform as to how to get out of the political deadlock in which Ukraine finds itself today. However, while credit to the skill of diplomats and their willingness to move away from maximalist aims and to move towards a compromise is due, it should be noted that de-escalation itself is just a tactical tool. 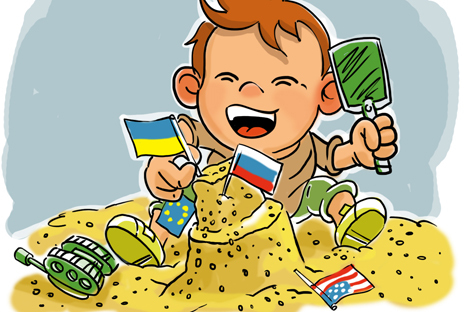 It can solve neither the crisis of the Ukrainian national state project, nor problems of Ukrainian identity and the formation of new rules for the international game. In recent months, the situation in Ukraine has overshadowed all significant events as the top issue for news agencies and newspaper headlines. Even the situation in the Middle East has been moved into the background. And there are more than serious grounds for the degree of close attention the crisis has been afforded. Since the series of Balkan wars, security in Europe has not been faced with such a tough challenge. And there is cause to despair, seeing the second largest and fifth most populated European country plunge into chaos and the collapse of statehood. The situation is aggravated by the fact that Ukraine has failed to formulate any comprehensive civil and political identity during the years of its independence. In fact, there are three main communities in this country (Ukrainian-speaking Ukrainians, Russian-speaking Ukrainians and Russians, not to mention numerous ethnic groups, such as about 200,000 Hungarians, for example), whose members have different views on their future and the future of the Ukrainian state. What problems have been extremely aggravated by the rapid crisis in Ukraine? The “Ukrainian revolt” has clearly demonstrated that the collapse of the Soviet Union is still not complete. Of course, the Soviet Union ceased to exist as a state and as a subject of international law more than two decades ago. However, the collapse of the once united country cannot be regarded merely as a formal legal act. The execution of the Belavezha Accords put an end to the USSR, but it did not create and could not create new public and civic identities. Meanwhile, it was not enough for new countries to call themselves Ukraine, Moldova or Georgia. Virtually all former Soviet republics that became new independent states faced big problems on their paths into the future. The USSR could afford to ensure the “territorial integrities” of Ukraine, Azerbaijan, Georgia, and Moldova by relying on its repressive apparatus and powerful propaganda. However, after 1991, the newly emerged states needed to find ways to form new citizens. Ukraine did not choose to follow the path of regional diversification, which could have taken into account the interests of different parts of the country. As long as the Ukrainian authorities ensured a balance of interests of different elite groups, “national unity” was able to be preserved. As soon as the Maidan revolt in Kiev destroyed the customary status quo, the centrifugal tendencies began to gain momentum. After Russian President Vladimir Putin commented on the involvement of the Russian military in the recent events in Crimea, many experts and journalists considered it as confirmation of Moscow’s “imperial ambitions”. However, they forget here that Russia prolonged the so-called “big agreement” with Ukraine, based on the recognition of its borders, in 2008 shortly after “the five-day war” with Georgia in the Caucasus. It did not try to change the Belavezha principles of mutual recognition of the inter-republic borders in 1994-1995, when the Crimean pro-Russian public movement was growing. Simply because, although inconvenient, the government in Kiev could control the entire country. In order to intervene anywhere, there must be internal conditions for such an intervention. Indeed, who would seriously consider the possibility for pro-Russian propaganda in Lviv or Ternopil? Thus, there were fundamental reasons for centrifugal tendencies both in Crimea and in the south and east of Ukraine, even without the “green men”. This is the right time to note the second, fundamentally important point, which has been extremely aggravated by the current Ukrainian crisis. The foreign policy of the newly independent countries of Eurasia cannot be implemented in the conditions of a harsh confrontation with Russia. The thing is that large parts of the population in these countries are not ready for integration with the West via the alienation of the Russian Federation. This applies not only to Russians and Russian-speaking Ukrainians (by the way, even after the change in the status of the Crimea, about 40 percent of Ukrainians have a negative attitude towards integration with NATO, and this figure is much higher in certain regions). This also applies to the Gagauzes and Transnistrians in Moldova, as well as to Abkhazians and Ossetians, who are regarded as citizens of Georgia by the majority of the global community. In this regard, a reasonable question arises: Should the newly independent countries be presented with a tough choice: “either-or”, as was done for Ukraine on the eve of the signing of an association agreement with the EU? We should admit that there is a serious demand for European and NATO integration in the post-Soviet countries. However, there is also the demand for cooperation and even alliance with Russia in these countries. How can this puzzle be solved? There are two ways to solve it successfully. Russia and the West have to start either a new large-scale competition for dominance in this part of the world, turning the former Soviet countries into a ground for “intermediary wars”, or start a meaningful dialogue – where the special interests of Russia will be taken into account and considered, not in the context of primitive and ideological schemes as “re-Sovietization”, but as legitimate reasons. First published in Russia at RIA Novosti.